The Geneva Music Festival’s 2018 Season will take place from May 31 through June 17, and promises to be exciting, moving and inspirational. While planning and scheduling are still taking place, many concerts have been confirmed for next season. Audiences will enjoy the return of violinist Jinjoo Cho, pianist Hyun-soo Kim, organist Ray Nagem, violinist Geoffrey Herd, cellist Max Geissler, violinist Eliot Heaton, cellist Hannah Collins, violinist Shawn Moore, and the Cavani Quartet, among others. Of course, there will be new chamber concerts as well as a specially-themed second week (details to be announced soon). This season will also incorporate poetry and pre-concert talks as well as other unique performances. Following a successful kickoff last year, Jinjoo and Hyun-soo will again open the Geneva Music Festival’s season. This will be a concert to remember! That weekend, Jinjoo, Hyun-soo, and some of the members of the Cavani String Quartet will join GMF director Herd and Geissler for a concert titled a “Transfigured Night.” The concert will highlight the broad range of stylistic experimentation that was taking place at the turn of the 20th century. Among the works featured will be “Faure Piano Quartet No. 1 in C-minor” and Schoenberg’s massive and virtuosic sextet “Verklarte Nacht,” (“Transfigured Night”), a piece based on a poem. Music and poetry will be sharing the stage at several events this season, including when the Cavani Quartet returns with a variation on their “Collage: Music and Poetry” project. 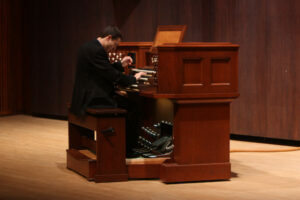 Juilliard Organists at Paul Hall on Wednesday night, May 5, 2010. During the last week of the season, Raymond Nagem, associate music director at the Cathedral of St. John the Divine in NYC, will again showcase the majestic organs of the churches of the region. The 2018 Season’s second-week theme will be announced later this month, with information about some of the concerts scheduled as part of the celebration. Be sure to subscribe to the newsletter if you don’t already receive it, or check Facebook and Twitter for up-to-date information. For more information, or to make a tax-deductible gift prior to the end of the year, visit www.genevamusicfestival.com.